Shakes are a good way to keep your weight low, and protein shakes are even better. Know what protein shakes are best for you to keep a low weight. One of the biggest challenges before many eyeing weight loss is what to eat or drink to lose weight. For the people wanting to lose it, there will be as many ways. Incorporating protein shakes in diet is one effective way to multiply your efforts. They do not trigger weight loss directly, but provide nutritional support so that workouts become more effective. There are no best protein shakes for weight loss. One recipe that seems working for you may not work for other. Moreover, all depends on how one uses it. Fruit is an essential ingredient for protein shakes, although adding in protein powder is entirely optional. You should add protein powder when there are no other sources of protein in your shake. Protein becomes important as protein will help keep your body feeling full. When you have weight loss on your mind, fruit is used in large part. The amount of fruit also determines the flavour and consistency. Adding fruit in big amount provides a huge boost of vitamins and antioxidants that your body needs for overall health. Banana Protein Shake: Blend two scoops of vanilla protein powder, a banana, five ounces of light soy milk and one tablespoon of almond mixture. Add a few drops of vanilla extract and four to six ice cubes. Orange Creamsicle Protein Shake: Blend two scoops of vanilla protein powder, a glass of orange juice, one teaspoon of vanilla extract, one banana, a few strawberries and four to six ice cubes. Wild Berry Protein Shake: Blend two scoops of vanilla protein powder, five raspberries, three strawberries, a few blueberries and a glass skimmed milk. The shake will provide you with loads of protein, but also plenty of vitamins. Strawberry Protein Shake: Blend half-a-glass of water, 5-6 strawberries, a tablespoon of flax seed oil, half teaspoon of vanilla extract and a spoon of protein powder. It will power you with extra energy. Peanut Butter Chocolate Protein Shake: Blend two scoops of chocolate protein powder, half a glass of skimmed milk, two tablespoons of yoghurt, one tablespoon of peanut butter and half spoon of caramel ice cream topping. Protein is an essential nutrient for every function of the body. 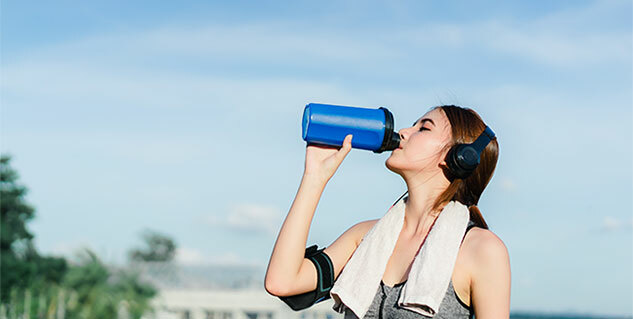 Protein shakes is one of the mediums for those eyeing weight loss, as it helps reduce caloric intake besides ensuring that nutritional needs of body are met.